Recently my department was given a set of 10 iPads thanks to a grant from the Saratoga Foundation for Innovative Learning. I previously blogged about the first couple of days we used the new iPads in my classroom. Today I am blogging about the second round of activities we have been doing. I was interested to try an activity with Padlet. 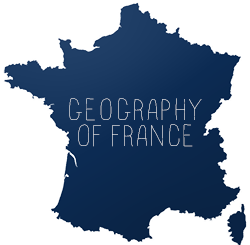 Padlet is a virtual noticeboard where users can add text and photos. I wanted my students to draw pictures in the Jot app and then upload them and write a caption. The problem was that Padlet does not work very well on the iPad when trying to upload photos (there's no app, and the site does not seem to be optimized for tablet use). So after browsing through other similar sites and apps, I settled on Lino. Lino actually has an app, so it is fully functional on the iPad. 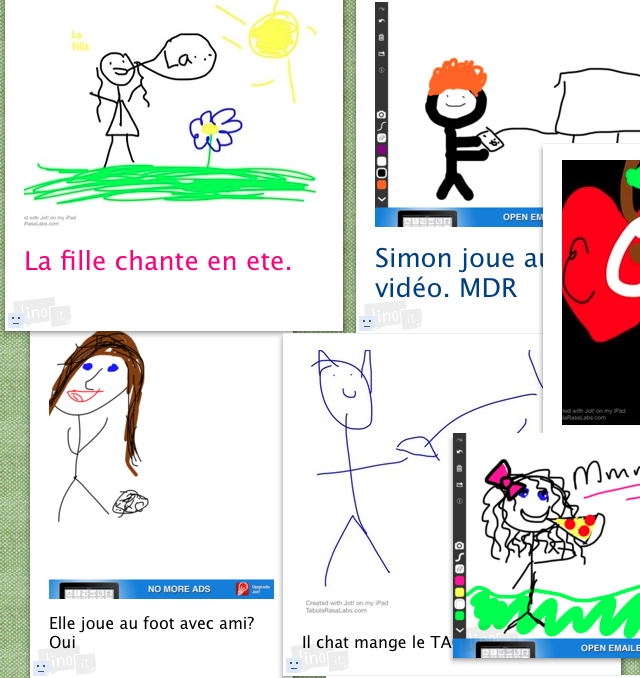 In groups of two or three, students thought up a French sentence, drew a picture of it in Jot, uploaded it to Lino, and then wrote a caption for another group. It was cool to see the board get updated on the SMART Board in real time. That made it easy for me to see if groups were on task and address any major errors (although I was circling around the room, too, but the students zoom in on the board when they write the caption). My only issue with Lino was that a lot of the posts kept appearing on top of each other, and I would have to go over and organize them on my computer. Not really a big deal, but if I can find an app that organizes them more easily, I'll use that next time. About halfway through the day, we ran out of space on the board (I didn't think it was necessary to use a different board for each class), so we ended up making a second board. Above, a screen shot of one of the boards. You can see the actual boards here. Students who finish tasks early are allowed to play on the DuoLingo app. I love the app, but because the iPads are shared and students are not logging in, they aren't able to make as much progress as they would at home. I'm searching for other options for early finishers. Having the iPads at their disposal gives us so many ways to use that leftover time more productively and keep them engaged in the language. Finally, I also used the iPads for stations in a quiz review (pictured above). I had never done stations before, but I think I'm hooked! This was the first opportunity for students to have one on one time with the iPads. At one station, students were writing descriptions on white boards of what was going on in a photo, and a "mini-prof" would go over the possible answers with them (the mini-profs were very enthusiastic!). At another station, students looked at a paper with about 16 different images on it. In pairs, one partner described what was going on in the picture, and the other pointed to the one they were talking about. At the iPad station, students played games that worked with mechanics and grammar, most of them cloze type activities. Some students really enjoyed them, while others felt they could have been more interactive. I liked them because students got instant feedback on whether or not their answers were correct, without the teacher hovering over them the whole time. That being said, I'm on the lookout for apps that are a little more engaging and allow me design a quiz where I can provide information on why an answer is incorrect as well. 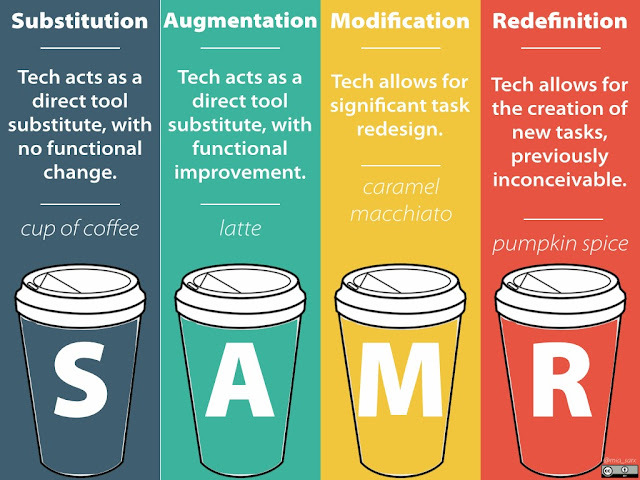 The SAMR model, explained above by Jonathan Brubaker, complete with a coffee analogy, helps teachers determine how useful a certain technology is in conjunction with a certain task. Click on the above graphic to visit Jonathan's blog and read his thoughts on the SAMR model. I first shared this image on my post about the value of low-tech in a high-tech world, but I think it bears mentioning again. 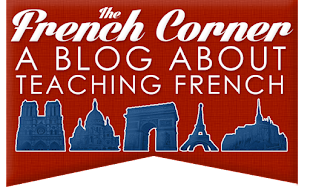 Another iPad-loving French teacher who has blogged about the SAMR model is Mme Mallette. She is further along in her iPad journey than I am, so be sure to read her blog for excellent ideas. The SAMR model is always in my mind when conceiving tasks with the iPad. That doesn't mean all my tasks meet the "redefinition" criterion though (hardly!). In this first year of using the devices, it's natural that more of the tasks will fall under "substitution" or "augmentation," and that's not a bad thing, I've learned. Sometimes, it's necessary to start there and see how the activities and projects play out before building up to "modification" and "redefinition" tasks. Having the SAMR model in my mind, though, helps me stay mindful of trying to harness the most potential from technology. Stay tuned for my next installment of the iPad diaries, where I'll share a creative project my students recently completed! As always, if you use iPads in your classroom and have app suggestions (especially on the topics I mentioned in the post) or comments, please feel free to add them!